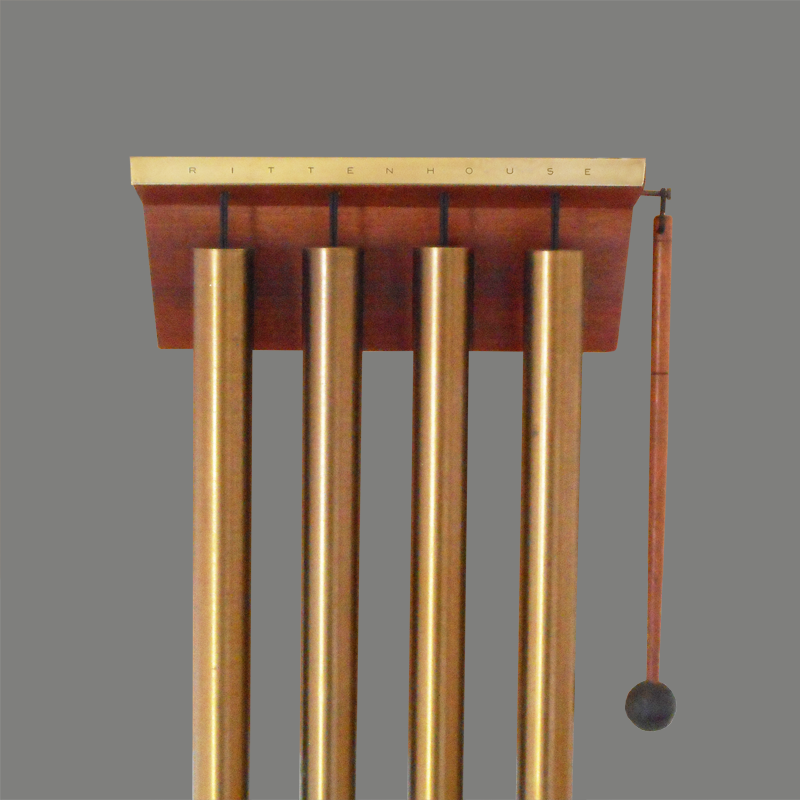 This innovative chime is an exercise in mid-century minimalism. 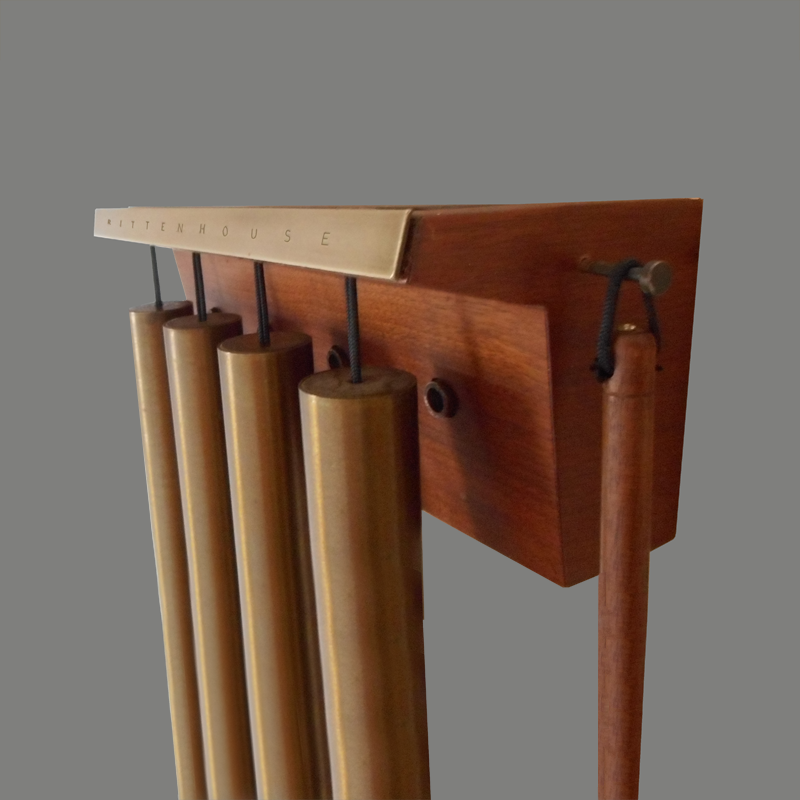 This chime was made possible by the then newly-developed Rittenhouse Master Model Controller which could be located discreetly and remotely from the chime. 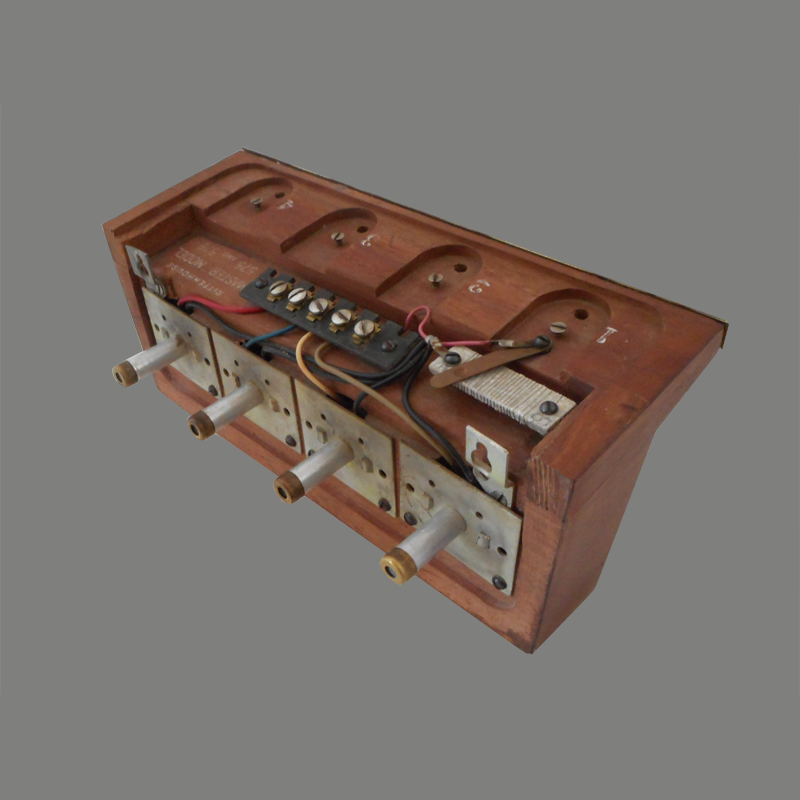 This allowed the designer, Jean Otis Reinecke to streamline the solenoid unit at the top of the chime. 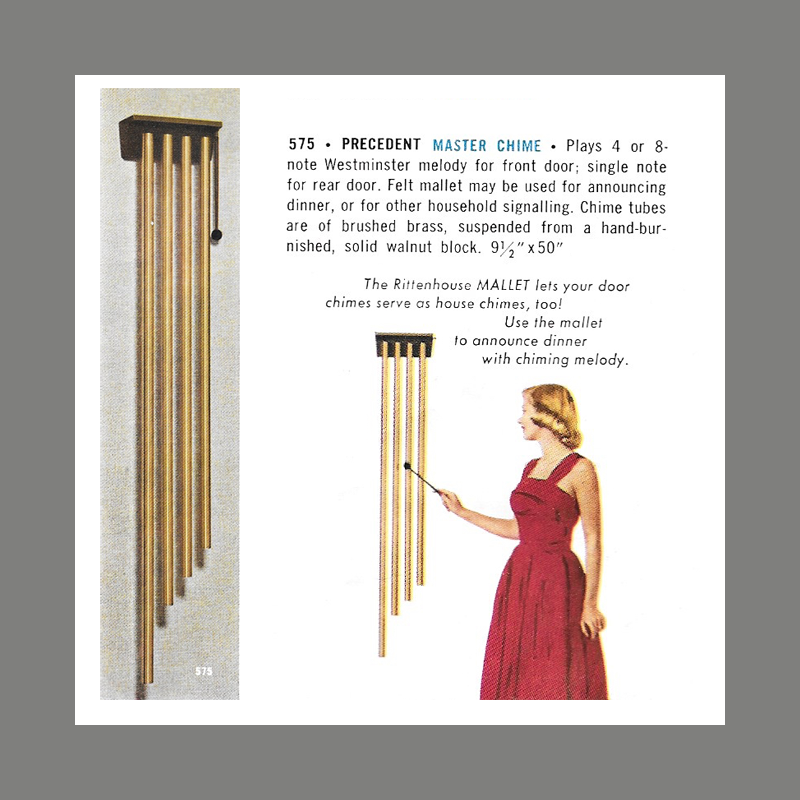 For a bit of flare and additional utility, a mallet hangs from the side allowing users to signal other members of the household by playing a note or melody by manually striking the bells. Presumably, for ideas and inspiration, the instructions included a small selection of melodies that could be played. This signalling feature was shared with the Rittenhouse Prelude, also by Reinecke. Modern, functional, simplicity styled by Jean O. Reinecke, national leader of contemporary design. 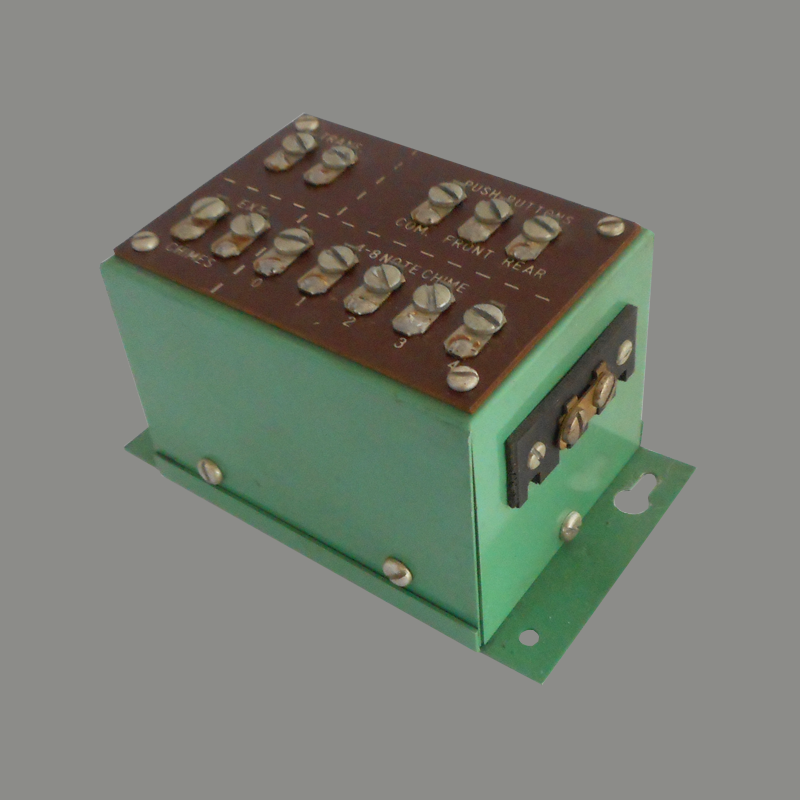 Automatically plays choice of 4 or 8 note signals for the front door, single note for the rear door. Felt mallet adds a new decorative note and may be used to play a variety of tunes for announcing dinner, or for other household signalling purposes. Chime tubes are of solid brushed brass, suspended from a hand burnished solid walnut block. Price includes felt mallet (chime may installed with or without mallet) adjustable volume control , life-time floating striker, famous Synchromatic Timer and heavy duty 24-volt chime transformer. The Precedent saw limited sales during its relatively short production run between 1956 and the early 1960s. Consumers may have been put off by it’s somewhat radical design. Another factor may have been a relatively complex installation. Like other early long bell chimes a hollow had to be created in the wall to accommodate the protruding solenoids to allow the head of the chime to lie flat against the wall. A clever bell-hanging scheme is another, less cumbersome, feature incorporated by Reinecke. The bell hanger cords are drawn through the decorative top of the solenoid head where they are looped around screws to suspend the bells. A dust cover is then set on top for a neat appearance from above. 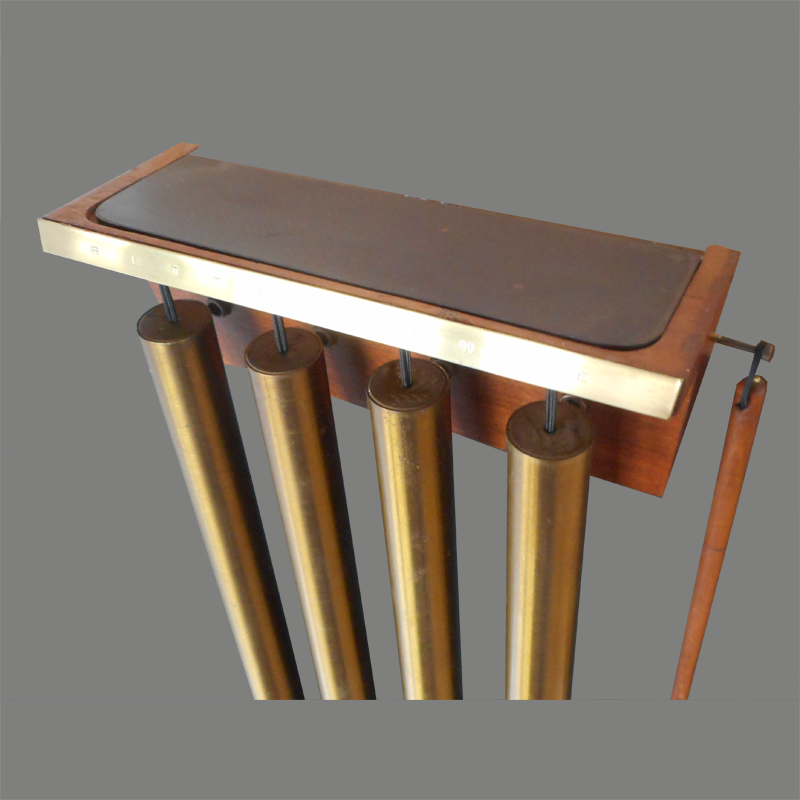 Today, the Precedent is far less common, than the similarly featured Prelude Resonator chime. Sadly, both chimes are often found without the Master Controller unit.